You see there, I wish I had the ability to take good photos. Because the autumn colours were so gorgeous. My favourite time of the year in a lovely place, stopping off at Sizergh Castle on the way home from England’s Lake District this weekend. It was probably the last we’ll get of the autumn colour in its full splendour; the trees are already growing bare. It’s so fleeting. Some attempts to capture it are below. 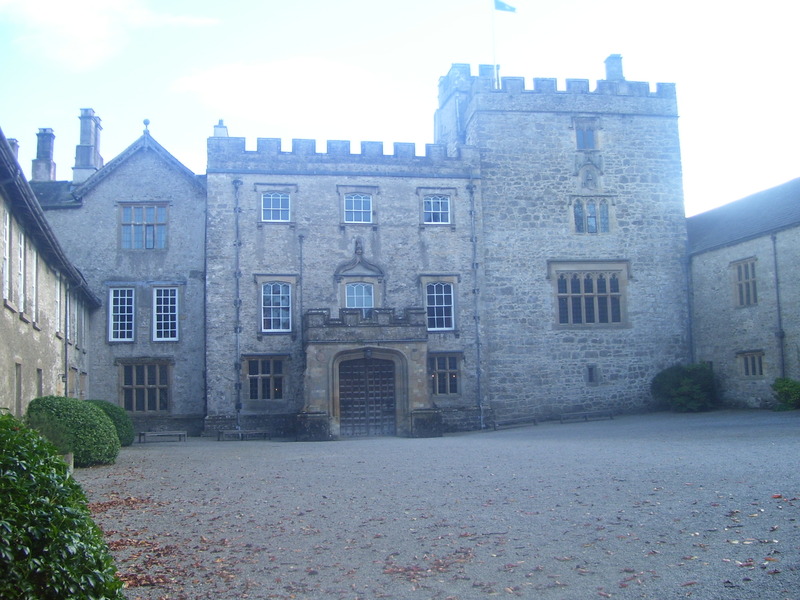 Sizergh Castle (pronounced ‘sizer’ to rhyme with ‘visor’) is in south Cumbria and it dates from the 14th century (in parts). Some of its rooms are open to the public to view (though it is closed for winter when the family use it—imagine living in such a place! ), but we spent more time outside in its extensive grounds. The weather was everything you want from an autumn day, cool and crisp, but sunny and clear. I had never been to Sizergh before, but country walks aside, visiting the various stately homes and castles around Britain—indeed the rest of Europe, when I can—is one of my pleasures during such breaks. Not because I am in thrall to the aristocracy or to royalty (I am not), but for other enchantments these places bring. The grounds, the architecture, the abundant skill and craft all about, yes, but something else: the undying flame of a childhood fancy. Did you ever draw maps as a child? Not the ones in a Geography class, but of fantasy places? An island perhaps, marking out the mountains, dangerous cliffs, the sandy beach, shallow waters that the sharks swam in, and groves where coconuts could be picked. It might have been a treasure map, a big X to mark the burial site of the swag, right in the most inaccessible spot? Most of all though, I drew castles. Typically I would sketch out the inside, pulling away the front wall like that of a dolls’ house to show what lay within. Cased in the thick walls there would be dungeons and battlements, but most of my time was spent on showing the rooms. As chief architect and interior decorator, I would furnish these to meet every possible need. The cellars would hold vats and crates and bottles of food and produce. You could withstand a siege for months in there. Fires would burn in every grate and each soft comfort possible was provided to ensure the occupants were cosy inside. No, real Medieval times were not so comfortable, not even for the wealthy, but these were make-believe castles, remember. Maybe it would not be wise to delve too deeply into the psychology here. Did I want to hide away from something? Not that I am aware of. I think, as with the island maps, I was creating a location of ideal fantasy, secretive and hidden from the world, its mini native culture protected from intrusion. In my writing now, I realise how much the main setting is a place of seclusion, not so much safe from attack as from the eyes and discriminations of society, meaning the occupants have freedom to live in the way they choose. Not that I have ever had an overt desire to spend time in a commune—flat-sharing in my student days and twenties was quite enough. In all likelihood it is simply an escape fantasy, the notion of being able to hide for a while. Whilst I love the semi-rural location I live in, I am not sure I could stay somewhere truly far-flung and isolated for years on end either. Some people feel the pull towards islands and settings that are remote and secluded, others push them away, perhaps fearing the isolation or boredom. Thinking carefully, I believe the place imports little as long as long as there is Beauty. Otherwise, pick up your feet and run! Ah Normandy, site of its own amazing castles. I too have been lucky to live in different countries, and now lucky too to live somewhere with beauty. In the absence of le juste? But so true, we need it now not to blind but to comfort us. One takes comfort where one can find it. 🙂 I did enjoy your post and such lovely photographs. Thank you for reading, Though too kind re photos! I have a decent camera but use my little snappy one as it fits in my pocket! Great autumn pictures! As for locations that I like, I used to thrive off of the energy of urban environments (New York City, Washington, DC, etc.). But that’s changed as years pass, and I’ve gone back to my suburban roots. Same with me! Younger years in different cities, but now retreated back to small-town life. There is something fascinating about castles – real or make believe. The grandchildren love playing with the Playmobil castle when they come and for several years we have had stories turned into books about their alter egos who live in the castle! Yes, maybe it’s the idea of one’s own little domain that stimulates the imagination. I am still attracted to dolls houses! You’re very kind, thank you for reading, Libre. I could never live in a remote locale for a long period of time. Energy of an urban environment energizes me. Know what you mean, even as a born-again country mouse I need city fixes. Beautiful pictures! Your post reminded me of something I used to do when I was a kid. I would make a treasure map of our neighborhood, then hide an actual penny or two at the spot I marked “X” on the map. I would tack the map up on a tree for someone to find and follow. What fun! It is, wish my photo did it more justice. Fall is my favorite time of the year too. When I was little I spent hours outside on fall days chasing leaves and leaning into the wind. Most of the worlds I build then were far less formal than castles. More likely a some kind of secret hideout, with fabricated ideas of understanding the land to the point it would protect you, and the excitement of sneakily avoiding the detection of whoever was following you!